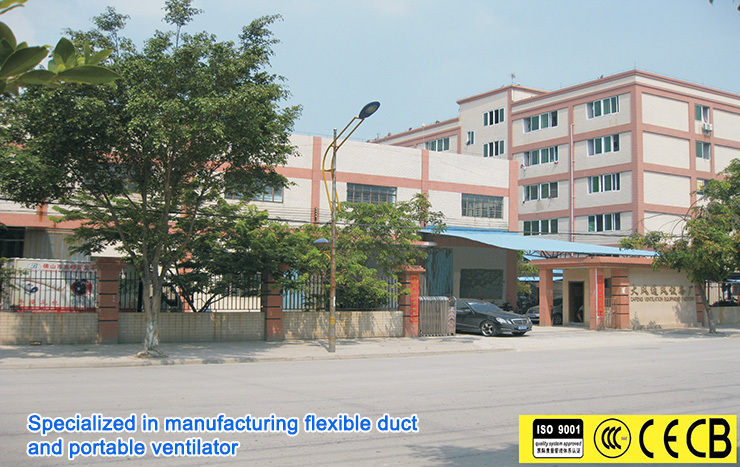 Located in the electrical brand forest of Pearl River Delta –Foshan Guangdong, Dafeng Ventilation Equipment Factory is specialized in manufacturing flexible duct and portable ventilator. With the advanced technology and automated equipments,after over 10-year constant efforts in this filed, Dafeng has become a great potential factory that owns the mature technical force, advanced processing equipments, rich experience, extensive sales network and complete service system. Base on such a large scale plant and a great variety of products, Dafeng products are hot sale in China and extending to every corner of the world. Carrying on past brilliance and making timely progress, we will keep on providing you with “superior products, satisfying services and favorable prices”. Welcome to Dafeng.